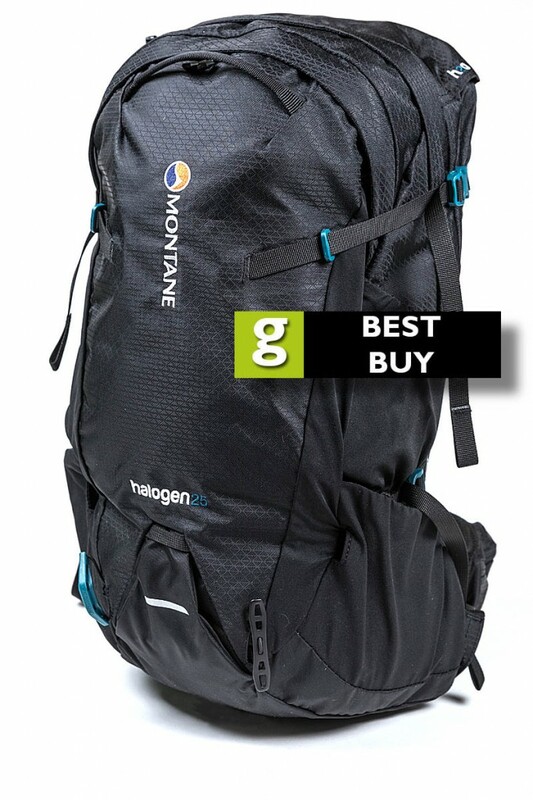 This daypack from Montane is ideal for summer trips to the hills or countryside, with a capacity that will swallow all you’re likely to need for day in the great outdoors. 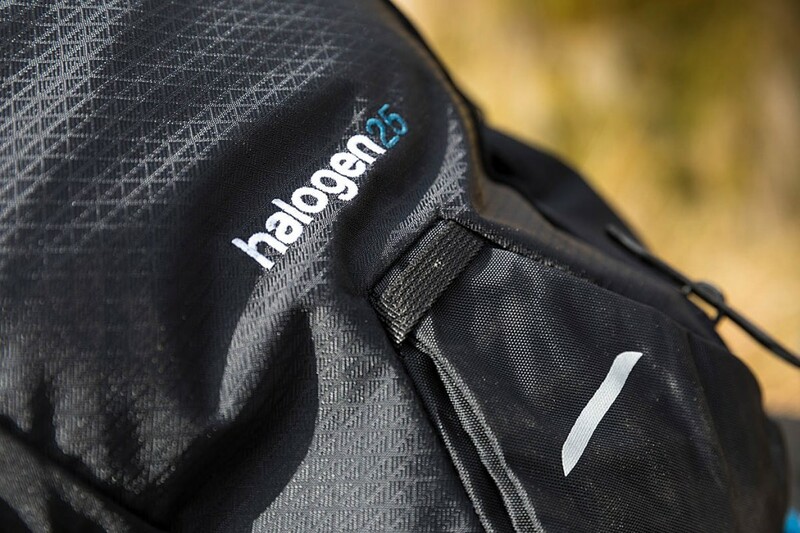 Despite its relatively small size, the Halogen 25 packs a lot of the features you might expect in a bigger rucksack. The pack’s back uses the Zephyr FX system. This has cut-out foam sections covered in a lightweight mesh, which Montane describes as ‘shell friendly’. There’s a little extra foam in the lumbar area where some of the load’s weight is likely to rest, but there’s enough space between the foam sections to provide a good amount of ventilation. The cut-away foam section is laminated on to another harder-backed foam sheet that gives the back some rigidity. The top section of the back is broader, with the pack’s back narrowing towards the hip section, fitting the body’s natural shape. The main body of the rucksack is made from 210 denier nylon in a ripstop pattern, while the base of the pack uses double thickness nylon. Both feel robust and should offer good abrasion resistance. The harness has ventilated foam padding and has tensioner straps at the top to enable the pack to be pulled in close to the body when needed. There’s an elasticated loop on the right strap to enable a drinking tube to be passed through and then routed into a cowled aperture on the body of the rucksack. 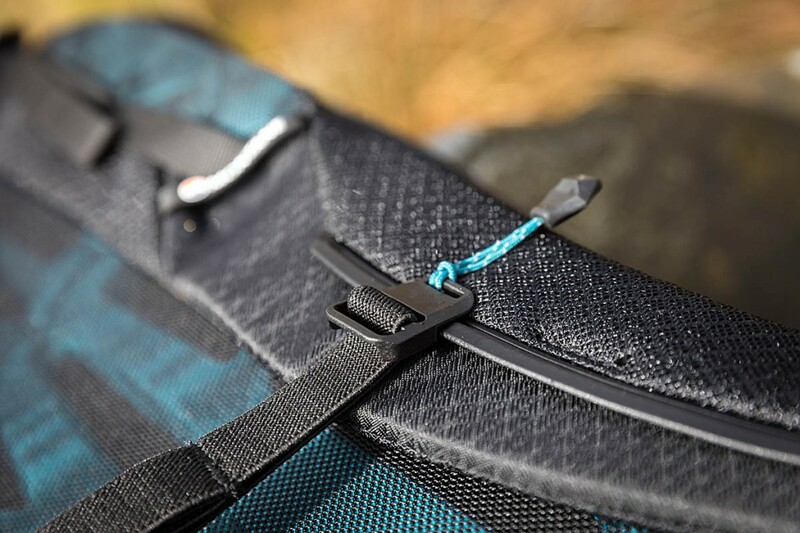 There’s a similar but unelasticated loop on the left strap to enable a carabiner or similar to be attached. The sternum strap is an unusual design. Adjustment height on the right harness strap is via a conventional if fiddly five-position daisy chain, but on the left side the plastic buckle clips into a continuous plastic rail with small sprocket-like lugs on the back which lock the buckle into place. This Montane Click and Go system takes a bit of getting used to but works well and means the buckle is smaller and sits neatly against the harness strap. The sternum strap is also elasticated which means there’s less resistance when your chest expands during hard breathing. The hip belt has broad main sections with similar padding to the harness. There are small zipped pockets on each side and the belt culminates in short webbing section with plastic buckles and retainers for the excess. The Halogen 25’s main compartment is accessed via a zipped top and is quite roomy. The zip has a storm flap to help keep out the weather. We managed to pack in all we needed for full-day walking in spring and summer. Montane says the pack is also suitable for lightweight winter excursions in the UK, and if you’re careful about how much you stash into it, we think it’s just about big enough for winter walking. Inside the main compartment is a pouch for a hydration reservoir, with a hook-and-loop suspension loop. Tube entry is via the right shoulder. On the outside of the rucksack is another zipped pocket, which is quite a good size and can be used for keeping wet items or gear you need quicker access to. The sides of this pocket are slightly stretchy, allowing quite an amount of clothing or gear to be stuffed into it. Inside this outer pocket is a smaller zipped compartment that also contains a key clip. The pack has twin grab or haul handles at the back and front. There are two pairs of compression straps on the side of the rucksack, the top ones having buckles that can be unfastened. The Halogen 25 also has what Montane calls ‘baguette pockets’ on its sides. These combine conventional stretch bucket pocket bottoms with a stretch sleeve, so longer items, such as that French bread you’ve packed for your mountain-top picnic, can be held securely. More likely you’ll use them for items such as a tall water bottle, collapsed walking poles or a rolled up waterproof. It’s a nice touch that removes that doubt over whether that your bottle or whatever you’ve placed in the side pockets will still be there when you get to the top of the hill. Conventional poles can be attached to the elasticated pole loop at the base of the pack and secured using the top compression strap. A similar system, which uses the Tool Anchor ice-axe attachment at the base, can be used for winter tools. There’s also a front loop for attaching a lamp, so the pack can be used when cycling at night. The Halogen 25 was comfortable in use, with our loads, often including fairly weighty camera gear, supported well on the broad straps and hip belt. There was just enough stiffness in the back to keep the pack in shape and the back was comfortable with reasonable ventilation. 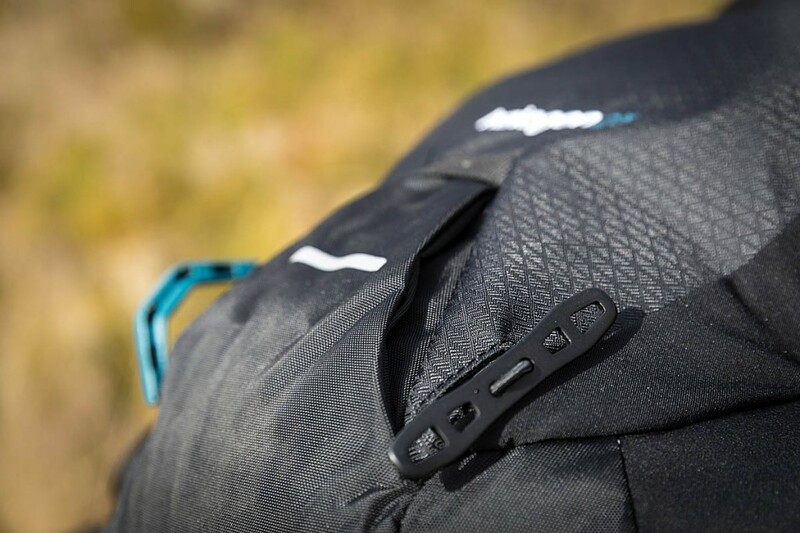 What we really liked about the Montane pack were its numerous little design touches that demonstrated thought had been put into what its users need. The rucksack is small enough for day use yet has all the features you might find on bigger packs. Quality of the fabric and fittings was good and it felt sturdy. It’s not an ultra-lightweight pack – it’s approaching the 1kg mark, but it’s a good choice particularly for those who take part in multiple activities. It feels like a proper, grown-up rucksack and, as with all good outdoor gear, once it was on our back, we pretty much forgot it was there. The Halogen 25 was supplied to grough by Montane. More details are on the Montane website.